This rich yellow, deliciously moist cake, fragrant with saffron and lemon, is irresistible when served with a couple of scoops of clotted cream ice cream. Preheat the oven to 170°C, gas mark 3. Soak the saffron in 2 tablespoons of hot water. Grease 2 round non-stick 20cm loose-bottomed cake tins. Use a whisk or wooden spoon to cream the butter until soft, then beat in the sugar until light and fluffy. Add the eggs one at a time, mixing in a teaspoon of flour with each to prevent curdling. Add the saffron infusion and vanilla. Sift in the remaining flour and the almonds, folding in well. Divide the cake mixture between the tins. Bake for about 25 minutes until a metal skewer inserted in the middle of the cake comes out clean, then turn the oven off and leave the cakes there for a further 5 minutes. Meanwhile, prepare the syrup. Place the icing sugar and 75ml water into a saucepan and bring to the boil. Reduce the heat, simmer for 5 minutes, then add the lemon zest and juice. Simmer for a further 2 minutes. Remove from the heat and set aside. Remove the cakes from the oven and, while they are still warm, pierce the surface of the cakes several times with a skewer. Pour the warm syrup over the cakes, allowing the liquid to seep in while they cool. 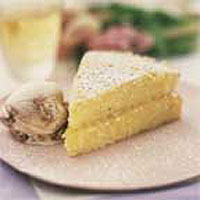 Then ease the cooled cakes out of the tins, spread the lemon curd over one of the two cakes and sandwich with the other. Cover and chill until ready to serve. Dust with extra icing sugar and serve immediately with the ice cream. Leftover lemon curd keeps well in the fridge for up to 3 weeks and makes a lovely dessert folded into bio yogurt. f you don't have time to make this cake, try a Waitrose Lemon Torte from the freezer cabinet. Defrost for 2-2½ hours before eating.